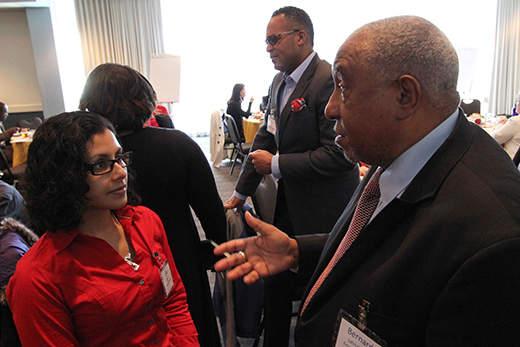 On Feb. 5, the Emory Student Affairs Institute hosted a Summit on Race for Higher Education Professionals, attracting 50 participants from more than a dozen colleges and universities in metro Atlanta, elsewhere in Georgia and the Southeast, and as far away as the University of Southern California. The daylong event examined race, privilege, social justice and social climates on campuses across the country. Presenters and facilitators represented Emory, Morehouse College and Georgia State University. The gathering featured structured dialogues, facilitated discussions, action plan development, and a video presentation by and dialogue with Emory’s student-driven Issues Troupe. “I have learned a lot that will enhance my facilitation skills,” said participant Elba Valerio, a program coordinator for the Intercultural Center at Brandeis University, "especially for creating space for dialogue with others when we are wrestling with our own fears about discussing real issues." The Emory Student Affairs Institute, a joint venture of Emory Campus Life and Emory Law, will also offer summer seminars, June 5-11, in three areas: higher education law, budget and finance, and crisis leadership.